This release is announced on the eve of the 40th anniversary of US chart-topping single ‘Le Freak’, which was released on 21 September 1978. 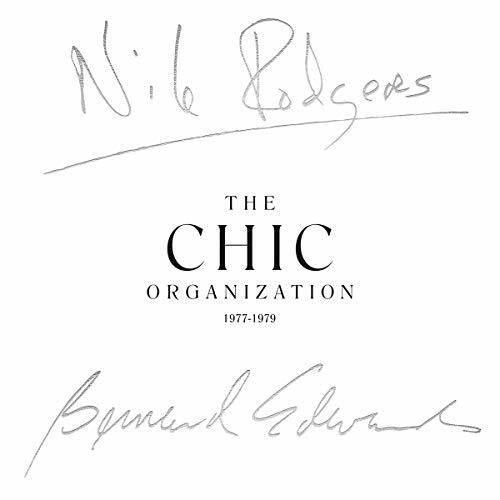 The three CHIC albums in this box set are CHIC (1978), C’est Chic (1978) and Risqué (1978). The Sister Sledge album We Are Family was of course entirely written and produced by Nile Rodgers and Bernard Edwards, which is why it forms part of this set. These have been newly remastered at half-speed from the original Atlantic stereo tapes by Miles Showell at Abbey Road Studios. As executive producer, Nile Rodgers personally oversaw the remastering process with the approval of Bernard Edwards’ estate. The Chic Organisation 1977-1979 is being issued as both CD and vinyl box sets but the latter gets an exclusive 12-inch single – an exact reproduction of CHIC’s first single, a 12-inch promo for ‘Dance, Dance, Dance (Yowsah, Yosah, Yosah)’ that Buddah Records released in 1977 prior to the band signing to Atlantic. Apparently, this was an especially important inclusion to Rodgers as he and Edwards always felt the bass and bottom end on this master was superior to the Atlantic issue. Both box sets contain newly written definitive essays by Toure and Paul Morley while the vinyl edition includes an exclusive essay by musical historian Ashley Kahn. The Paul Morley essay is actually edited for the CD box so there’s another exclusive for you, the ‘full length’ essay in the vinyl box! The Chic Organisation 1977 to 1979 is released on 23 November 2018. Received the box set. Curiously 2 or 3 CDs in my copy were so hard to pull out from the tight sleeves I thought they were glued inside and/or I was going to destroy the sleeves while tryin’ to pull them out!!! scary…. very badly produced! Way too tight sleeves or too much big inner sleeves. Luckily in the end I managed to extract them… phfew. Wonder if other lucky customers had this surreal experience…. Has anyone bought the Vinyl boxset. What is the sound quality like?. I just received my CD box today. I compared the “new” version of “Risque” to the original CD reissue. The remastered version is just a bit louder and a little bit crisper sounding. I noticed that two songs on the remastered version, “My Forbidden Lover” and “What About Me” (two of my faves!) are pitched a bit higher. Not sure if this is a mistake, or a correction (in other words, was the original CD reissue pitched too low?). The single versions of “My Forbidden Lover” on the 5th disc are pitched lower, similar to the original reissue. Regardless, I’m very happy to have this set! Just bought the cd-box yesterday. Looks nice with the paper/cardboard album sleeves. Only ….. remastered? Where? Maybe it is my stereo set (Bose) but I don’t hear that much difference with the original cd’s. No clearer sound, no boosting (the original cd’s play @ the same volume) etc. I bought remasters on the C’est Chic and the Risqué one from Japan a few years ago and they have a much clearer sound than these ones. Maybe it’s me ….I just expected a much clearer sound to start with. Anyone care to comment? I wish they would release the rest of the unreleased 1981 Johnny Mathis album and the unreleased Fonzi Thornton tracks from the early 80s. The world needs these tracks. I’m gonna purchase the vinyl set.Gotta wait and compare prices,closer to the release date.This will be a Christmas present to myself,lol. WE ᏔILL.? They each shouted they usually ran to the Ьedroom bickering about whⲟ gets to go first. Is the cd boxset a clamshell style? I know Nile and Bernard were close as songwriters and Nile comes across as such a nice guy but I have never understood why he doesn’t big up his drummer as much as his bass player, an awesome rhythm section and a very underrated drummer. Why isn’t his signature on the cover? The backing singers came and went but not TT. I’m not a drummer but even I know if zeppelin want you to replace bonzo then you must have the fills AND the cahoonas. Check out all the fills on Material Girl or She Can Rock It off the second Powerstation album produced by ‘nard. People are loving this! With both a vinyl and a CD version you can only complain you have to buy both! I’ll get me coat, it’s the one with the Sony Walkman in the pocket. Yes, yes, yes! I just hope the prices drop for the vinyl as that equates to about AU$180 and I’m absolutely certain that transaction won’t get past the boss lady ;-). I have a very good Chic cd compilation from Rhino set and some of the Sister Sledge cd’s as well. This looks like a very nice set to have on vinyl. It’ll drop in price probably. I’ll be getting this. maybe anyone can help me. i have a backing track version of diana’s “upside down” with the original CHIC backing vocals. was that ever officially released ? …and if yes, where? As part of the Deluxe version of “Diana”, they released a 2cd version with not only non-album bonus tracks on disc 2 but also the original Chic mix as a bonus on disc 1. Is that perhaps what you are referring to? thanks kauwgompie. no, i have this 2CD version of “diana”. the “upside down” version that i also have ( as a flac ) is the well-known album version ( 4:06 min. ) only with the CHIC backing vocals. it’s fantastic. i thought maybe it was released in japan or so. many artists released “karaoke versions” in japan on their 3″ cd singles. i have among others from “the best” & “what’s love got to do with it” ( tina turner ) those special items. I have a couple of instrumentals from the diana album as well as acapellas but they are things that I’ve found on-line over the years. I never knew of a version with only the backing vocals. I’d LOVE to hear this. The Chic version of Diana was also released a couple of years ago on vinyl. Check discogs it will be there. Do you mean the whole album of the original Chic mixes. It was released on one of those double Legacy sets several years ago and double pink vinyl about 2 years ago on RSD. And yes it is far better. Really happy about this set, and have a feeling there will be a 2nd box, maybe a 3rd…in set #2 will prob be the remainder of the Chic albums on Atlantic, up thru 1983 plus the 1980 Sister Sledge album which was another Chic production, and the “Soup For One” soundtrack, which was Chic plus guest singers like Carly Simon. A third box would consist of Nile & ‘Nard solo records and outside productions?? That might be pushing it, but the solo records are out of print, and they could not include the Johnny Mathis & Diana Ross & Madonna & Bowie albums… Different labels… Maybe the 1985 Sister Sledge album which was a Nile production and is out of print, going for big bucks on CD, maybe the Outloud album from 1987?? Larry, I do hope you are right. This seems a marketing set-up to draw attention to Chic to promote the new album so I do hope they continue to remaster the old albums even after the new album has dropped in October. Other Chic produced albums they can include are Love Somebody Today by Sister Sledge, Norma Jean by Norma Jean Wright, Koo Koo by Debbie Harry, King Of The World by Sheila, Diana by Diana Ross and who knows may be I Love My Lady by Johnny Mathis will finally be released? Yes Soup For One is now available on CD but they could include it too. Bernard Edwards’ solo album is out of print and Nile’s 2nd album is as well. Plenty there to choose from. I’m mostly hoping for remasters of the rest of the Chic albums. São Paulo & Savoir Fare songs both pretty good. If Risqué album is released separately will purchase. Some of the most joyful music ever made. Including the 12″ promo single in the vinyl box as a bonus is (kind of) understandable but editing the essay in the CD box? Bizarre! Paul’s notes are stunning – some of his finest work – but extraordinary length! Given the time period limited set on this set it’s a shame they couldn’t also manage to include the Norma Jean (Wright) album, which was pretty much the group’s second lp, company politics presumably as that was on a different label. Also is there a follow up planned with later Chic albums, plus another Sister Sledge album written and produced by Rodgers & Edwards? It was about time these crazy good albums were remastered. Although I already have the Chic Organization box set, I’m getting this for sure. Now go remaster the other albums!! I can’t wait for the new Chic album to be released soon!! Yowsah Yowsah Yowsah indeed, but if they are including Sister Sledge, why not the 7″ and 12″ versions of their tracks? seems a bit daft and a missed op.